Like my previous raw food recipe this one is really refreshing and most palatable and it works on the principle that less is more (only four ingredients this time). Today’s recipe, like all my others really, was driven by what I had in my fridge at the time and what was about to turn. The result was this delicious juice, which I know you will enjoy. As with the last recipe I will give you the exact proportions I used. As usual I put a good measure of water into the blender followed by a medium-sized carrot and a good chunk of fresh root ginger and blitzed. I had one apple left that was just getting to the point where it was starting to look a bit sorry for itself, so that was the next thing to go in. Then I had about 150g of spinach left in a 200g bag that was one day past its “use-by” date, so the whole lot went in. 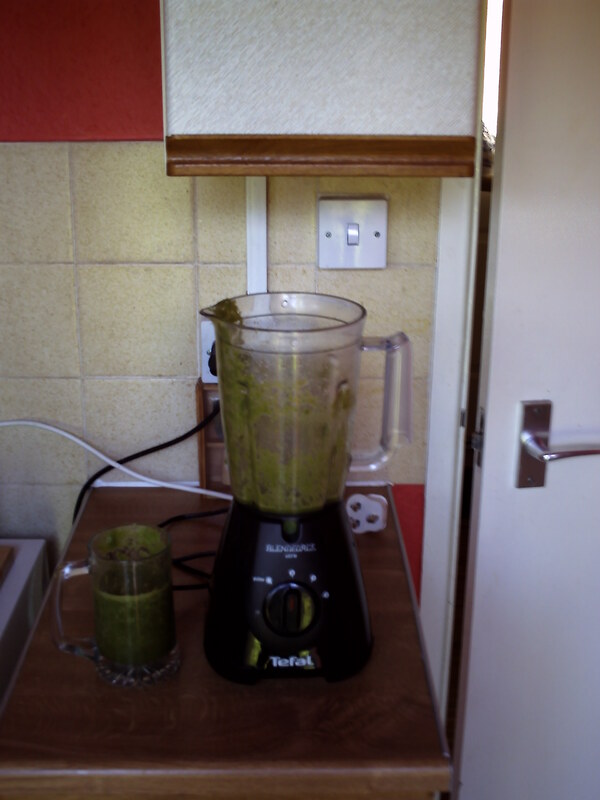 I gave it a good old blitz, adding a bit more water, and glugged it down for my breakfast. I’m so full of energy now that I’m actually stuck to the ceiling and typing by proxy. Happy blitzing my friends!